Most Texas Rangers fans have gone to at least a game or two in Arlington and were gripped by every captivating moment of the team's 2015 postseason run. But only real fans know the significance of the numbers 8, 34, and 1972, or where to find the best Rangers bars in Texas. 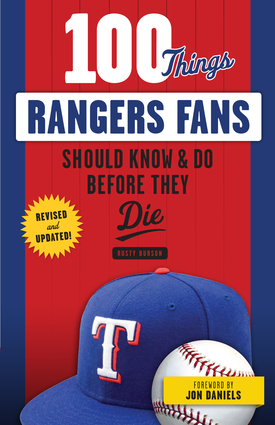 100 Things Rangers Fans Should Know & Do Before They Die is the ultimate resource for true fans of the Texas Rangers, whether you cheered on the Ryan Express or are a recent supporter of the team under Jeff Bannister. From the bizarre and wonderful 1977 season to the Josh Hamilton saga and beyond, experienced sportswriter Rusty Burson has collected every essential piece of Rangers knowledge, plus must-do activities, and ranks them all from 1 to 100, providing an entertaining and easy-to-follow checklist as you progress on your way to fan superstardom. This updated edition includes the Rangers' recent memorable successes, including the push to the 2015 playoffs, and new faces like Yu Darvish and Cole Hamels. Rusty Burson, a former sportswriter with the Galveston Daily News, Fort Worth Star-Telegram, and 12th Man Magazine, has authored 19 previous books. He attended his first Rangers game in 1972 and worked in the concession stands at old Arlington Stadium as a high school and college student. He and his wife, Vannessa, and three children live in College Station, Texas, where he works for Miramont Country Club.